You know how it is… when you’ve had a garden for a while, some times you get things coming up that you didn’t plant. In the side garden this year, we planted green and jalapeno peppers, canteloupes, and green beans. But this afternoon, we discovered some surprising volunteers. 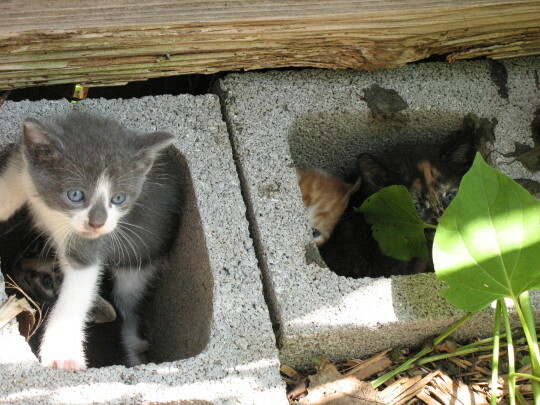 We found the kittens, hiding out in the cinder-block borders of our raised garden beds. 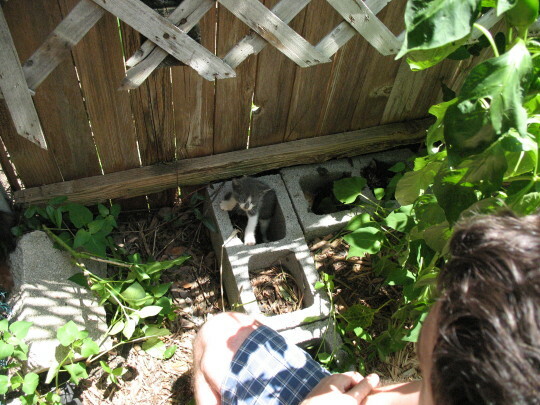 After we saw all of them, we figured out who the momma is – she’s a black tortoiseshell with a yellow tipped tail. She’s been around for about a year; I think somebody across the street feeds her, but she sort of lives at large in the neighborhood. She used to give our cats trouble, but seems to have settled down. They’re really cute! We put out some food, and Momma showed up, and we got to pet her and the kittens. We’re guessing about four weeks; after a couple more weeks, with plenty of feeding and handling, we’ll start thinking about what to do with them. Momma looks exactly like the one on the right, although it lacks her orange-tipped tail. We’re pretty sure we’ve seen seven, although there could be eight; they are pretty skittish. 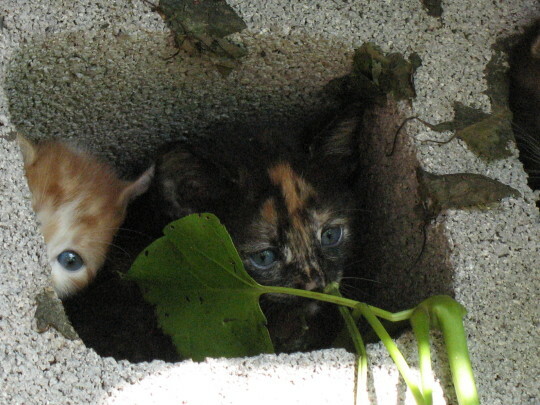 OMG KITTENS! And here I thought it would be lettuce! Too cute! You should submit pics to Cute Overload! will you guys keep one? Amazing what can happen when you mix peppers with canteloupes! Pretty cute crop, now where did you get those seeds? I have gotten some pretty interesting weeds springing up in cinderblock holes but that is some pretty adoable catnippers there. We’re of the same mind… mom may or may not be amenable to house-cat life, after so long being semi-wild, but we’ll have her in to the vet as soon as the kittens are off the milk. They’re safe in the side yard – no dogs can get in, and there’s a high fence on all sides. Probably why she chose it. Cool! I would be most happy to have these all get placed in good homes. Yes, I have it on my “to work on” list – it just keeps getting things in front of it. I have a spindle you can borrow, if you want to. If you’re wanting to learn to spin, I can also give you some wool to experiment on – Miro’s fur is challenging to work with. I know about how other projects come up and stuff. I want to learn to spin but, like you, where do I fit that in with all the other stuff??? 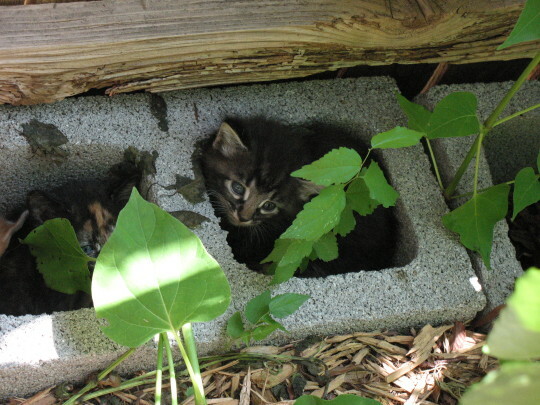 I had no idea that kittens could grow in cinder blocks… Here I’ve been using rain barrels. 🙂 Those are just adorable pics. Kudos to you for helping to take care, and preventing more feral kitties. You know I realize we have had a lot of rain of late, but one does not usually find cattails growing in cinderblocks. Great crop, but watch out. 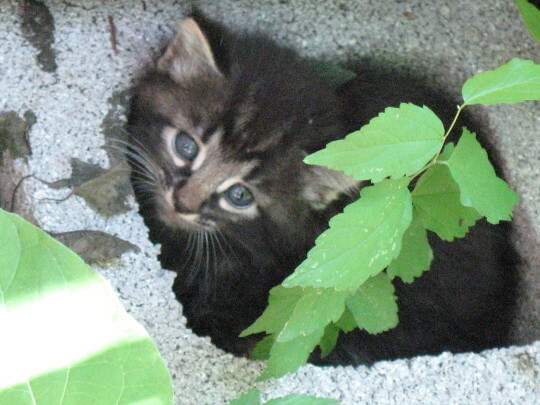 Kittens are considered an invasive species in nearly every state. Without careful management, you’ll end up with a house and garden full — with “crazy cat lady” status to follow. Seriously, I’m all warm and fuzzy inside now. OH that torte is STUNNING! They’re doing fine. Momma has moved them back under the deck, I think because of the heat. They will come out for the food, but then go back. We handle them as much as possible, usually at least three or four times a day. Other than fleas, they seem to be in excellent condition. They should be ready to go in a week or so – they’re still nursing quite a bit, although most of them are taking to the wet cat food and some dry fairly well. There are two orange ones; one (the one in the pics above) has more white, the other is a big marmalade fuzzball. Howdy! Check today’s entry – they’re wormed, flea-treated, and ready-to-go. Please let me know if you’d like to come and visit soon – I’m trying to get them placed this week. Check today’s entry – they’re wormed, flea-treated, and ready to go. Let me know if you’d like to come see them soon – I’m trying to get them out this week if possible. Anybody read Chinese? Science geek + yarn geek = win!